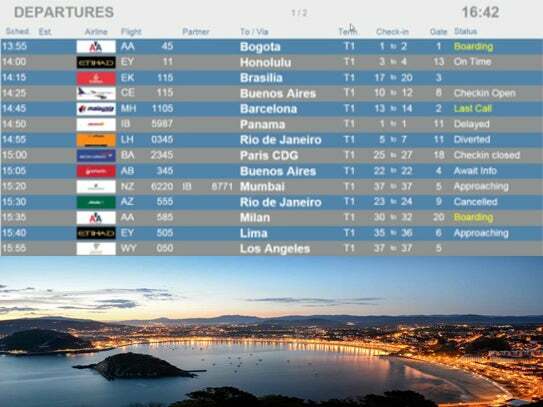 Dolphin is an integrated airport information suite that incorporates three solutions: flight information display system (FIDS), advertising content management system (ADS) and automatic flight announcement system (AFAS). In addition to its characteristics of easing system implementation and profitability for the airport operator, the Dolphin solution has been designed to work both on local as in remote hosting environments with operation models adapted to the needs of every client. Dolphin FIDS is a leading modular and scalable solution that shares information with other airport business agents (airline companies, handlers) over mobile devices such as smartphones or tablets. Its compatibility with latest smart embedded controllers helps airports to decrease the implementation costs (TCO) while enabling smoother maintenance. The Dolphin ADS solution enables airport operators to manage advertising and entertainment content on the various screens distributed throughout the airport. Dolphin ADS may be integrated into any FIDS solution, making it possible to create advertising campaigns based on the origin or destination of operations. Dolphin AFAS is the solution that has been developed for passenger information over the airport Public Address System PAS. Dolphin AFAS may be integrated into any PAS brand on the market, enabling manual or automatic message broadcasts in over 20 languages.